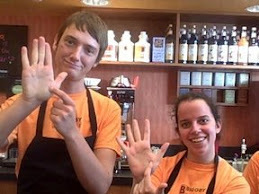 Biggby Coffee just celebrated its 15th year in business and is the fastest growing coffee franchise in the Midwest. There are two Biggby cafés nearby my office, and I love going there – for the coffee and (more importantly), for the conversations the employees engage me (and all the customers)in. I can’t think of another retail restaurant where the interaction is so positive. I met the Biggby CEO Bob Fish, aka “Biggby Bob” (@BiggbyBob) through Twitter recently when he “retweeted” (re-sent) a complaint he’d received from a customer. What this means is that his retweet had the potential to be viewed by a lot more people (including me) than it might have if Bob hadn’t re-sent it. I was fascinated – why would he let more people know about a customer complaint? With what I already knew about how Biggby employees interacted with customers in the stores, I figured there must be a story that connected the “Biggby Way” and the success of the company. So I asked Bob if he would be willing to be interviewed for my blog. He agreed and this post is the result. P.S. interestingly, the first thing Bob asked was about me and my business, even though our call was set up to interview him. Hmm….he caught me off guard (in a good way) and this added to my thought that he is a leader who models the behaviors he wants to be demonstrated in Biggby cafés. 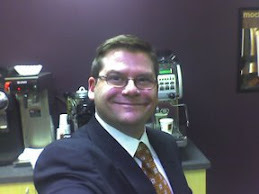 What would I experience at Biggby Coffee that I wouldn’t experience at one of your competitor’s places? When we opened in 1995, we wanted to make it more of a positive experience than the other café’s. We see coffee houses as the “fence we lean over” at a time when many of us don’t know the people who live next door. Even our coffee drink names take some of snobbery away from the way most people view “coffee houses” – names like Caramel Marvel and Butter Bear have a sense of fun to them. Our stores are highly socially engaged with customers and we invest in training our people about how to engage customers in conversations. We teach them the things that they can’t learn anywhere else, like the importance of maintaining eye contact and asking open ended questions. I noticed on Twitter that you retweeted a customer complaint so that even more people could see the complaint. Most CEO’s wouldn’t do that. What were you thinking? I was thinking it was the right thing to do. Social media is without filters – if I just retweet the stuff that is complimentary, I’d get called out on it. If we fail for a customer in some way, it’s okay – it shows we’re human. Relationships, whether on Twitter, through other social media sites, or in person, are paramount. And I’ve found that if you “get naked” and let your guard down, you can accomplish almost anything because it makes you believable and fallible like any human being. What is your biggest challenge as the leader of Biggby Coffee? My challenge has been learning how to herd chickens – my description of the difficulty of communicating in a way to get all franchises moving in the same direction. Since our franchises are all individually owned, this is a unique challenge. I’ve learned that communication is a huge thing, and that even when the message is consistent, recipients will hear it in their own ways. So it means that we have to be ever cognizant of how we frame the message and how it’s received. Your blog chronicles your travels to all 100+ franchises. What are you learning on these visits? Spending time in the stores allows me to get close to the customers. It’s like a focus group on steroids; when I am there in person, they tell me what they like and what they don’t like. It allows me to undo the “Ivory Tower Syndrome” and watch how The Biggby Way and our cultural values play out. Doesn’t Biggby sound like a great place to visit? Oh, and the coffee is good, too! GREAT interview, well written commentary! Nice job! I have to totally agree! It is a fun place and has great values! Great article and insight into the BIGGBY success. This is a great article and shows that every great concept has things that work well and once in awhile things that slip through the cracks. But BIGGBY learns from it's mistakes and in turn makes things better for everyone! You NEED to be a big FAN of complaints, and retweeting it is a perfect example of that kind of mindset. The people who complain are almost always your best customers--they're invested in you, your product, and the experience, which is why when things go wrong, they take the time to let you know about it. If it goes badly for a first time visitor, you're just likely not to ever see (or hear from) them again. Which is why, when customers have a complaint, you genuinely thank them for letting you know.